The biggest fan club of the Colorado Avalanche will return to the US for the eleventh time. The Eurolanche Fan Club will organize the Eurolanche Invasion XI during the 2018-19 season. The eleventh trip from Europe to Colorado Fan Club history will tie and set several new records of the project. For the second time in Invasion history, a total of 12 Eurolanche members take part in a single trip. They will represent six different countries – Austria, the Czech Republic, Croatia, Slovakia, Poland and the United Kingdom, setting a new Invasion record. The overall number of scheduled Colorado Avalanche games the participants will visit will also top all previous Invasions, as the group is slated to attend 8 games. Invasion XI will begin on February 12 and end on February 28, making it one of the longest trips in history. The main purpose of the trip will be the aforementioned eight Colorado Avalanche games. The participants of the trip will be in the stands of the Pepsi Center for the following six games – against the Toronto Maple Leafs, St. Louis Blues, Vegas Golden Knights, Winnipeg Jets, Florida Panthers and the Vancouver Canucks. For the third straight year and fourth year overall, the participants will also make a trip to watch the Avs play on the road. This year, they will support their boys in burgundy and blue in Chicago and Nashville. For the first time ever, Invasion participants will visit a total of eight Avalanche games. During the past six Invasions, its participants attended seven games at each respective trip. To be exact, participants of Invasion XI will attend nine ice-hockey games, as they will go to one game of the Avalanche’s new AHL affiliate, the Colorado Eagles, for the first time ever, against the San Antonio Rampage, the Avs’ former minor-league affiliate. However, it will be Eurolanche’s second visit to the Budweiser Events Center in Loveland, where they went to the team practice during the most recent Invasion. For the first time ever, Invasion participants will see the Vegas Golden Knights and the Toronto Maple Leafs in action against the Avs. Moreover, the Blackhawks will affirm their position as Colorado’s most-visited opponent, as the group will visit the eighth game in Invasion history between them and the Avs. Speaking about the rest of the opponents, it will be Eurolanche’s third game against the Blues; third game against the Jets; fourth game against the Panthers and the third game against the Canucks. Of Invasion XI’s 12 participants, only two have been to Denver before. Slovakia will be represented by Eurolanche Founder and President David Puchovsky, who will return to Denver for a record-setting tenth time, having only missed Invasion II, and Peter Junek, Tomas Oliva, Pavol Skyba, Marcel Sahul, Veronika Sahulova and Peter Kozusko, all for whom Invasion XI will be their first visit to the US. Each fan from the remaining quintet hails from a different country. Norbert Gruber from Austria will travel to Denver for the seventh time. This will be the first Invasion for Maja Andreuzzi from Croatia, Kieran Lavelle from the United Kingdom, Michal Serafinovic from the Czech Republic and Lukasz Tkocz from Poland. Interestingly enough, Pavol Skyba currently lives in the United Kingdom and Lukasz Tkocz in the US. Last but not least, this will be the first Invasion, where Eurolanche members originating from the United Kingdom, Croatia and Poland will be part of the trip. The busy Invasion XI schedule will begin on February 12, when the first participants of the trip will land in Denver and immediately drive to the Pepsi Center for their first game. They will spend the next two days in Las Vegas, where Eurolanche will return for the second time (the first visit took place during Invasion VIII). After this short field trip, the entire Invasion XI group will meet in Denver, where they will spend the next six days and attend three Avs games. A four-day road trip to Chicago and Nashville will follow. Eurolanche will be back in Chicago for the third time and for the second straight year, making it the most visited city and away team in Invasion history. A trip to Nashville will be a “first” for the Invasion project. After said road trip, the fans will come back to Denver for the final four days and two Avs games. Aside from the eight scheduled NHL games, the Invasion XI members will have a busy schedule each day, as the schedule includes must-see and traditional places and activities, and new ones, which have never been part of any previous Invasion. The fans will visit downtown Denver, Blackhawk and Central City, Georgetown, the ghost town of St. Elmo, the Colorado Gator Farm, Fraser (snowtubing), downtown Chicago and Nashville, the Jack Daniel’s Distillery in Lynchburg, the Red Rocks Amphitheater, Rocky Mountain National Wildlife Refuge and the Coors Brewery. The schedule will include two scenic drives, one in the Rocky Mountains and the other one – for the first time – north of Denver, mainly on the Poudre Canyon Rd. In total, Invasion XI participants will visit six different US States, which is another record of the project. The list includes Colorado, Nevada, Illinois, Indiana, Kentucky and Tennessee. The group will fly to and from Las Vegas and Chicago and will drive back and forth between Chicago and Nashville. Invasion XI activities will include of the meetings with Avalanche players and local fans just like each trip before as well as visits to the Avs practices. Possible times and locations for a meet & greet with European fans will be released at a later date. The local media will be notified about Eurolanche’s presence in town in advance. Eurolanche organized ten Eurolanche Invasions between 2008 and 2018 with an overall participation of 59 Fan Club’s members from 8 different European countries. During this span, they visited 10 US States, as well as Canada and Mexico; they’ve flown 200 000+ kilometers and spent 149 days in the US. Furthermore, they visited 63 Avalanche games, six of them on the road. The overall record of all attended games is 36-21-5 (the alumni game between Colorado and Detroit isn’t included). Invasion.Eurolanche.com is the main hub for all information regarding the trip (including an infographic of the project). Eurolanche was founded in 2007 and is the longest lasting fan project in the entire NHL. With almost 900 registered members from all continents and with regularly organized events, the Fan Club is the biggest fan project in the league as well. 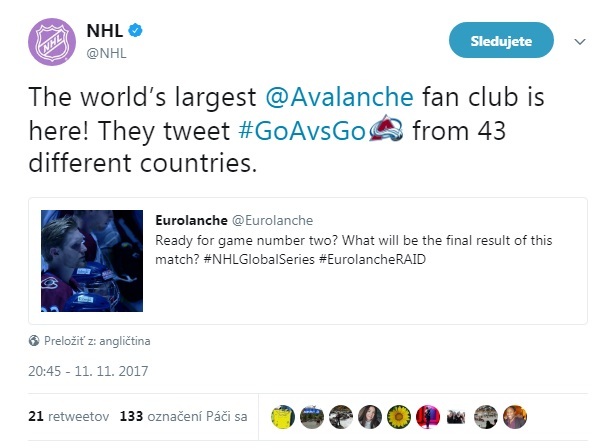 Eurolanche membership is free of charge for all Avalanche fans from around the world. Eurolanche organizes member meetings and meetings with Avalanche players too. Moreover, the Fan Club organized the biggest group event in Sweden to visit two Avs games in Europe (as part of the NHL’s Global Series) and published an own book in two languages.